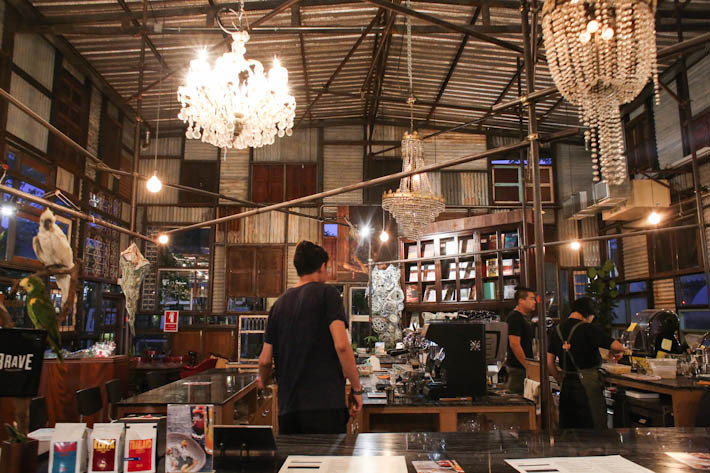 One Ounce For Onion at Ekkamai district in Bangkok needs no further introduction but did you know that this hipster cafe has opened another branch at the popular ChangChui this year? Head over to One Ounce For Onion for their handcrafted house brews and delightful range of light bites. Their straightforward menu offers little besides their signature espresso based drinks, smoothies and ChangChui specials (food and drinks that are exclusive to this outlet). It is not the place to go to if you are looking for a wide range of mains on the menu but somewhere to chill and catch up with your friends over coffee. Their Iced Latte (THB100/S$4.12) is prepared with the right balance of espresso and creamy milk. The refreshing drink came with a slightly bitter aftertaste just the way we like it. If you are looking for a drink to cool off from Bangkok’s sweltering heat, you cannot go wrong with an Iced Latte at One Ounce For Onion. Not keen on having coffee? There are other non-caffeine choices too. After getting to know our preferences, the friendly barista recommended a smoothie with a whimsical name—Summer Is Getting Better (THB140/S$5.76). The ingredients found inside include pineapple, pumpkin, ginger and green basil. It sounds like an odd combination but we were pleasantly surprised that the flavours actually went well together. The rich pineapple drink came with distinct hints of ginger that was not too overpowering for our liking. Feeling peckish, we decided to order it’s sound jap crab (THB220/S$9.05) which is a small portion crab meat salad with green apple, avocado, miso herbs and spicy mentaiko. While we think that it is rather pricey for such a small plate, the intense flavours got us hooked onto the dish. Have the crab meat and avocado together with toasted bread given at the side. It was so delicious that we finished it within minutes! Alternatively, you can also get the Bollywood Baller (THB280/S$11.52), Pasta Thai Garlic Bacon (THB180/S$7.40) and Porkball Gnocchi (THB180/S$7.40). Read: 7 Reasons Why You Must Visit ChangChui Night Market In Bangkok.